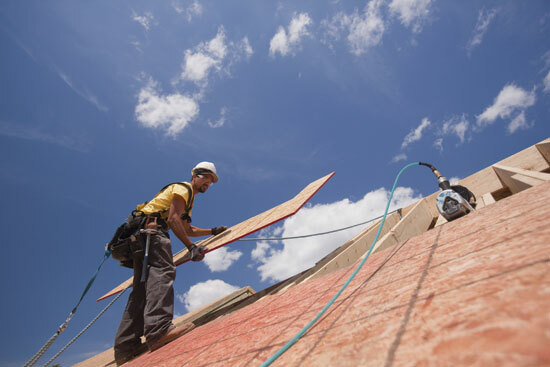 For roof sheathing and roof sheathing attachment, the increase in forces between edge zones and interior zones is larger than observed for walls. While wood structural panel sheathing of consistent grade and thickness is used over the length of the roof, two fastening schedules are often specified. One fastening schedule is for roof areas outside edge zones where fasteners are spaced farther apart. A second fastening schedule is for higher wind pressure roof areas within the edge zones where fasteners are more closely spaced. In some jurisdictions, ring shank (deformed shank or threaded) nails are required for attachment of roof sheathing to roof framing for resistance to high wind uplift forces. While generally considered to offer superior resistance to withdrawal from the framing than smooth shank nails, care should be taken to ensure that the ring shank nail specified has both adequate withdrawal strength to secure sheathing to roof framing for wind suction pressures and sufficient lateral strength to develop the required diaphragm behavior of the roof. One technique for use of threaded nails is to utilize the NDS-specified withdrawal and lateral resistance provisions as part of an engineered design. While wood structural panel sheathing of consistent grade and thickness is used over the length of the roof, two fastening schedules are often specified—one for roof areas outside edge zones and a second for higher wind pressure roof areas within the edge zones where fasteners are more closely spaced. Building scientists use the term “load path” to describe how forces flow through a building's structure to the final point of resistance at the foundation. A continuous load path for all wind forces acting on the building must be established for reliable building performance. In 2011, the Southern and Midwestern U.S. experienced an unprecedented outbreak of tornadoes, resulting in the loss of hundreds of lives and thousands of homes. According to FEMA Mitigation Assessment Team investigations13, newer homes generally performed well under design-level wind loading, but a lack of above-code design construction practices left buildings vulnerable to damage. Appendix G of the report lays out prescriptive techniques that can improve building performance during weaker tornadoes in particular. Among other things, it notes that “Strengthening buildings by maintaining load path continuity and reinforcing connections has proven successful for mitigating hurricane wind damage and provides a good model for mitigating tornado wind damage.” This appendix offers techniques for developing a complete load path starting from an engineered design for wind resistance—i.e., sheathing to roof framing, roof framing to wall framing, and wall framing to foundation connections. A continuous load path must be provided to adequately pass wind forces through the building's structural elements from the roof to the foundation and, ultimately, to the soil below. In wood-frame buildings, the continuous load path is created by a system of wood framing, structural sheathing, metal connectors, fasteners (such as nails and screws), diaphragms and shear walls. A continuous load path is like a chain that ties building elements together from the roof to the foundation for both wind shear forces and wind uplift forces. A continuous load path is critical during a high wind event because it helps hold the building together. Anchorage must be provided at appropriate locations to resist wind-induced actions, such as overturning, uplift and sliding. Resistance to wind uplift and overturning is provided by the dead load of and within a building, including weight of foundations and any soil directly above them. However, only the dead load likely to be in place during a design wind event is permitted to be used in design. This requires the designer to exercise caution in using dead loads. Previous editions of the code specified that the overturning moment and sliding due to wind load could not exceed two-thirds of the dead load stabilizing moment. Today, the use of reduced dead loads for resistance to wind induced forces is accomplished through load combinations of IBC 1605.1. The design of a continuous load path is accomplished by use of code-referenced wood design standards for members, connections, shear walls and diaphragms. The design standard for wood construction referenced by the IBC is the National Design Specification (NDS) for Wood Construction, published by the American Wood Council (AWC). It includes the necessary design procedures and design value adjustment factors for beams, columns, joists, structural glued laminated timber, timber piles, prefabricated I-joists, structural composite lumber, cross laminated timber, and connections, for lateral (including wind and seismic) and gravity loads and certain special loading conditions. It also contains design procedures for calculated fire resistance of exposed wood members. Reference design values for structural sawn lumber, structural glued laminated timber and round timber poles and piles are contained in the NDS Supplement, a compendium of design values as reported by the grading agencies responsible for their establishment. Another AWC standard integral to wind design, is the Special Design Provisions for Wind and Seismic (SDPWS). It is directly referenced by the IBC for the required design of lateral force-resisting systems such as nailed wood-frame shear walls and diaphragms which resist wind, seismic or other lateral loads. Section 2305 of the IBC contains additional criteria, primarily for stapled shear wall and stapled diaphragm construction. The AWC Wood Frame Construction Manual for One- and Two-Family Dwellings (WFCM) provides engineered and prescriptive design requirements and is referenced by the IBC and the IRC. The provisions of the WFCM are based on dead, live, snow, seismic and wind loads derived from the provisions of ASCE 7-10. In general, the framing systems described in the WFCM utilize repetitive member wood assemblies. Although intended for one- and two-family dwellings, the WFCM is a useful tool in the design of non-residential buildings that fit within its scope for building size and assigned loads. The expanded applicability of WFCM design information beyond one- and two-family dwellings is recognized in 2015 IBC Section 2309. Designing a building to withstand the potentially devastating forces of high winds is one of the greatest challenges an architect or engineer can face. Each structure, with its own unique characteristics and site conditions, reacts differently to wind loads—and many complex and interrelated issues must be considered to ensure that a building is truly wind-resistive. As discussed in this course, wood is a proven choice for wind-resistive construction. Experience has shown that code-compliant wood buildings perform exceedingly well during high wind events such as hurricanes. Wood is strong and most wood-frame buildings offer the advantage of repetitive members and multiple connections, which together create redundant load paths to effectively transfer wind forces from the building envelope to the foundation and soil below. For the latest research on wood buildings and wind, please visit research.ThinkWood.com. Think Wood connects you to in-depth research, tools, CEU courses, case studies, and more to dispel myths and misconceptions about softwood use, inspire ingenuity, and demonstrate all the possibilities of wood in the built environment. WoodWorks provides free one-on-one project assistance related to nonresidential and multifamily wood buildings. Technical experts offer support from design through construction on issues that range from allowable heights and areas for different construction types to structural design, lateral systems, and fire- or acoustical-rated assemblies. The AWC is committed to ensuring a resilient, safe, and sustainable built environment. To achieve these objectives, AWC contributes to the development of sound public policies, codes, and regulations that allow for the appropriate and responsible manufacture and use of wood products. AWC supports the utilization of wood products by developing and disseminating consensus standards, comprehensive technical guidelines, and tools for wood design and construction, as well as providing education regarding their application. 4. Basic wind speeds need to be increased where records or experience indicate that the expected wind speed is higher than those reflected in the Figures referenced in Section 1609.1 of the IBC. Ultimate design wind speeds, Vult, for special wind regions indicated near mountainous terrain and near gorges shall be in accordance with local jurisdiction requirements, in accordance with Section 26.5.2 of ASCE 7. In non-hurricane-prone regions, Vult can be determined in accordance with Section 26.5.3 of ASCE 7. 5. The change from fastest-mile wind speed map to a 3-second gust map was necessary for several reasons, foremost of which was that weather stations across the United States ceased collecting fastest-mile wind speed data. 6. Some jurisdictions may, for simplicity of enforcement, default to a single wind speed for all locations between contours. In this case, they would be required to use 130 mph.